Mammoet version of the Mercedes-Benz Actros 4160 SLT 8x4 heavy haulage truck. 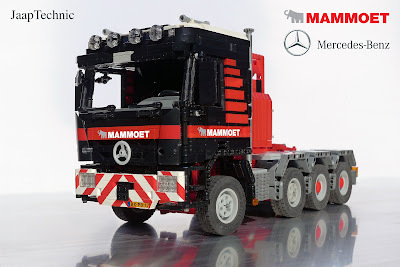 The whole truck is made in scale 1:16,5 and is a combination of studded en studless LEGO. These trucks are widely used to transport heavy loads. 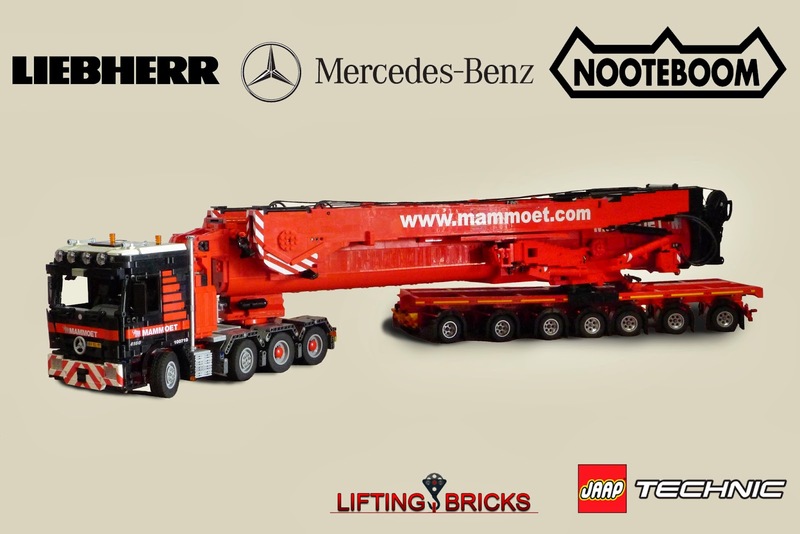 Such as a crane boom for a Liebherr LTM 11200 9.1 crane. 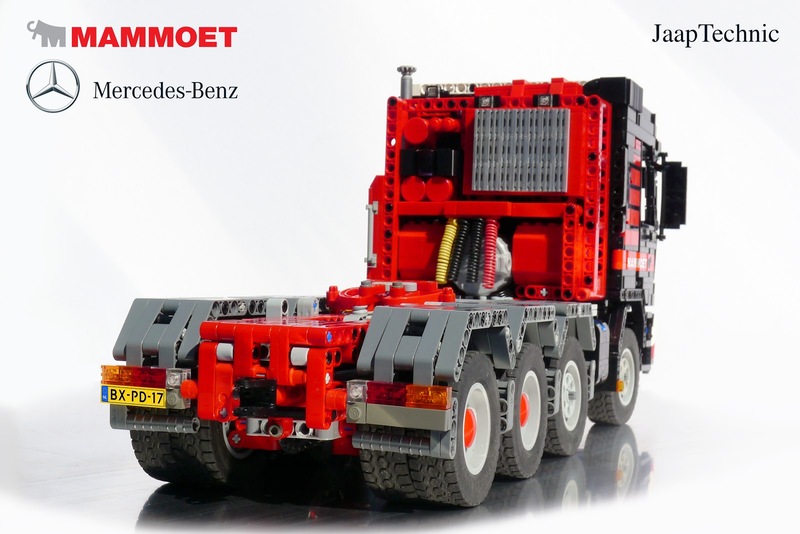 This company, Mammoet, was a long time in my planning because the color scheme of the truck is easy to made in lego bricks. Most is black and red. Behind the cab there is an cooling unit which contains a lot of elements to simulates the enormous amount of air tanks, filters, exhausts etc. I also decided to make some wires to give it a more realistic look. Those wires are made from electricity wire.  Which can be easily turned around a steel bar. 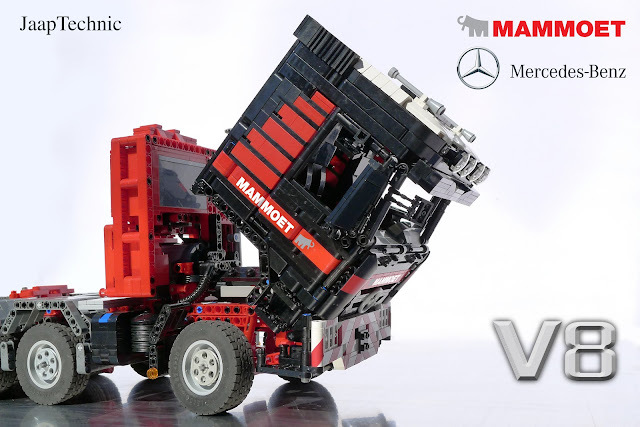 The cab can be tiled forward to give access to the V8 engine. The engine is almoste like the real one. I had to do a little compromise because the space inside the engine must be large enough to fit the lego powerfunctions servo which steers the first and second axle. 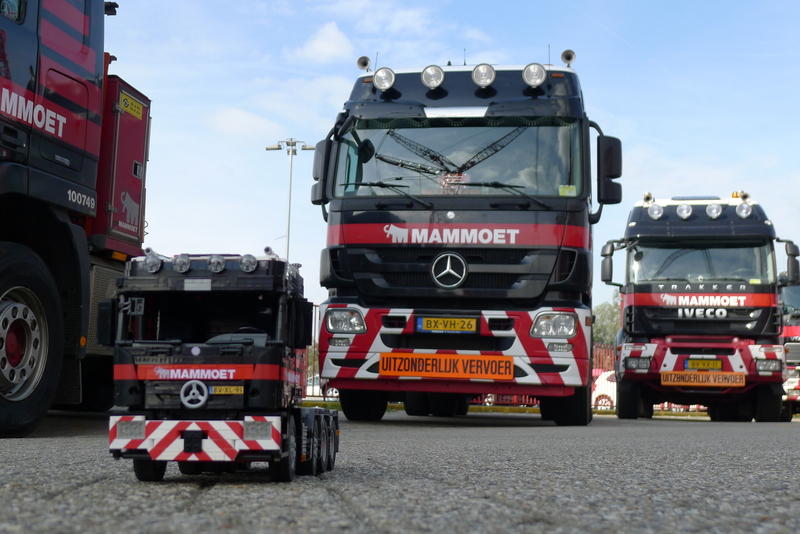 This truck was seen on the Mammoet open day 2013. It was displayed next to a LEGO Liebherr LTM 11200 9.1 which is in almoste the same scale. Together they form a nice combo! And at least some pictures to compare it with an real truck. 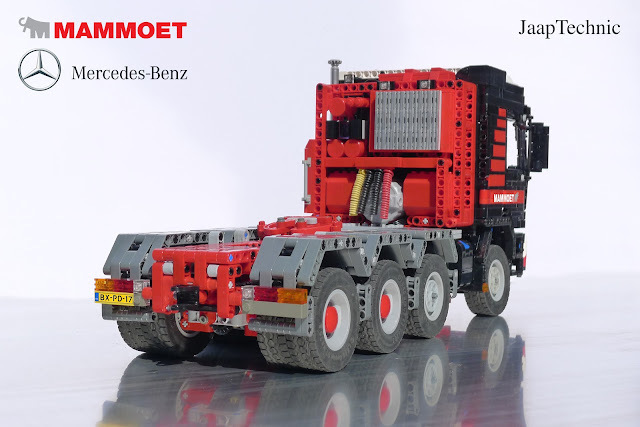 The trucks displayed on the background is a 6x4 not a 8x4 like my lego model. looking forward to the plans for purchase!! very cool truck ! Now we just need the building plans for it and.. for the very, very cool liebherr 11200 ! I know it's not yours.. but please talk liftingbricks into makeing building plans for it ! Or maybe he could let you do them. I would buy both for sure ! We can not make building instructions for the 11200. There are only a few people on the planet which owns so much lego which is needed to build that massive crane. So, No, we will never create building instructions for the 11200. Yes it is a very Big build.. ohh Well, to bad.. I just know it's the coolest build in Youtube i've seen, so to build a copi of it would have been a dream Project for me. It would have taken years to get all the bricks, but that wouldent matter. 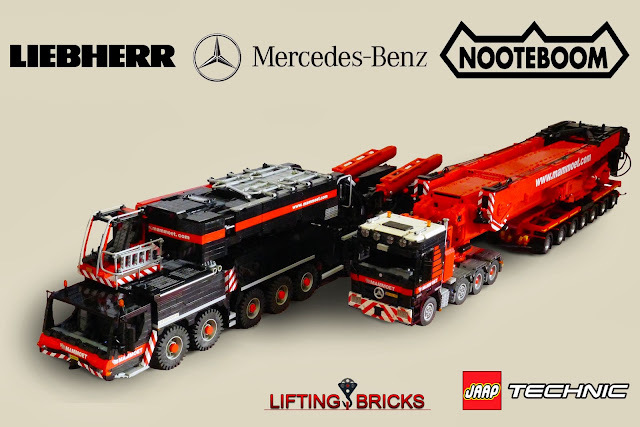 To have the liebherr 11200 in lego would have been great !